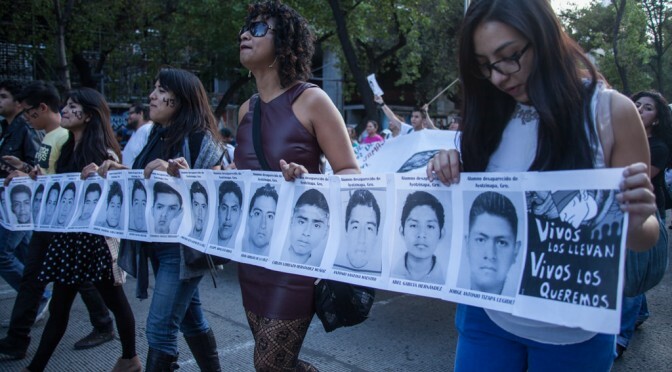 Tens of thousands marched in Mexico City and Iguala, Mexico on Wednesday to protest the disappearance of 43 student-teachers who went missing on September 26. Reflecting growing outrage over the failure of Mexican authorities to resolve the case, a group of masked protesters separated from the peaceful demonstration of several thousand in Iguala, broke into the city hall and smashed computers and windows before setting fire to the building. In Mexico City, students from 29 universities joined 50,000 marchers under the banner: “Alive they took them, alive we want them back!” One man held a sign that read: “Mexico has turned into an immense unmarked grave.” A candlelight vigil in the Zócalo, the historic central square, followed the demonstration. Also Wednesday, Mexico’s attorney general said Iguala’s mayor and his wife were “probable masterminds” behind the Ayotzinapa Normal School students’ attack and abduction. Six people were also killed on the day the students disappeared. At a press conference in Mexico City, Attorney General Jesús Murillo Karam said his office has issued warrants for the arrest of Iguala Mayor Jose Luis Abarca, his wife Maria de los Angeles Pineda Villa, and police chief Felipe Flores Velazquez. All three have been on the run since the day after the incident and are considered fugitives. Murillo accused Abarca of ordering police to confront the students to prevent them from disrupting a public speech by his wife. He said that on the night of September 26, as the left-wing students were heading toward Iguala in several buses to protest against discriminatory hiring practices and to collect funds for their college, the order to stop them came over the local police radios, given by “A-5,” the code name for Iguala’s mayor. Local police allegedly intercepted the students’ buses and started shooting, killing six people and rounding up the 43 students. According to the attorney general, the students were transported to the outskirts of Iguala. Those orders, he said, came from the head of the drug gang Guerreros Unidos, whom federal authorities captured last week. Murillo named the mayor’s wife as the “principal operator” of the Guerreros Unidos, and said that she, together with her husband, ran the group’s illegal activities right out of Iguala’s city hall. Watch Reuters’ video of the protest here.